Now with my trusty dash cam documenting everything that is happening in front of me, my comfort level traveling to Richmond has increased significantly. At the very least, I can compile a compilation of Richmond's greatest hits (sorry for the pun). 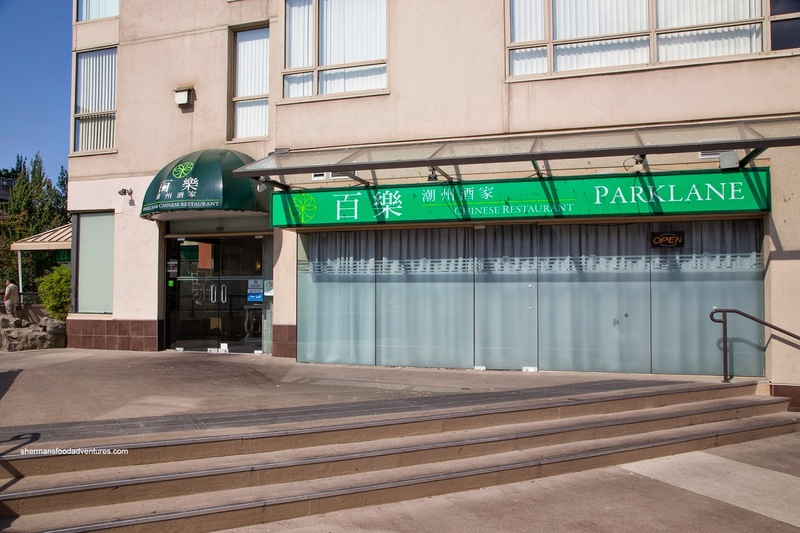 Hence, it has made it that much easier for me to continue my assault (not sure if that word is ironic or not) on Richmond Dim Sum spots with Parklane as our next destination. 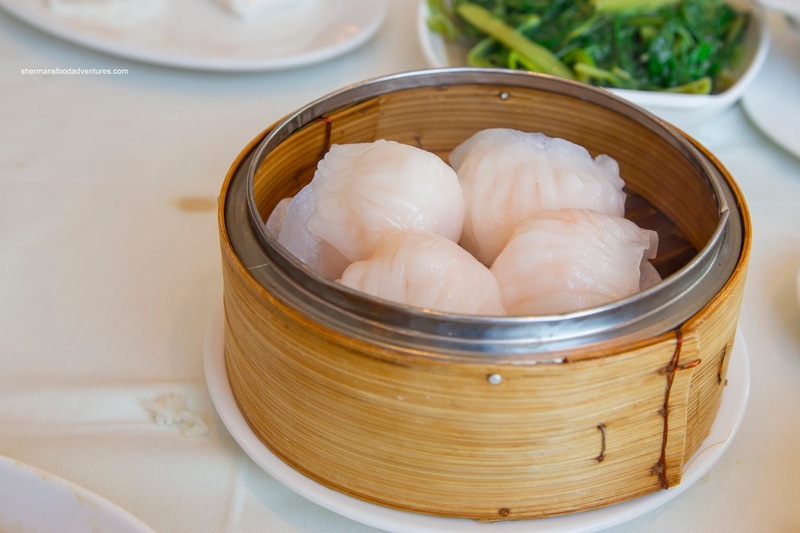 Situated in the former location of Empire, Parklane offers up Cantonese Dim Sum with Chiu Chow options. As we pulled into the parking lot, I was giddy since I was able to park in an isolated spot to my lonesome. No threat of door dings! With our very first 2 dishes, the Chiu Chow cuisine was in full effect. 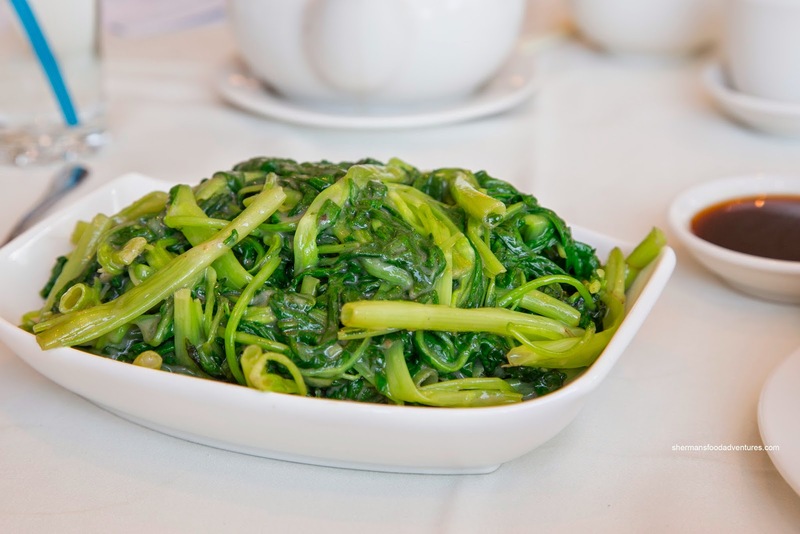 I sampled the classic Ong Choy with fermented tofu and it was prepared decently. The vegetable itself was still somewhat crunchy while fully cooked. However, the whole dish was rather wet and lacking the zip from the fermented tofu. It could've used more of it and a touch more corn starch. 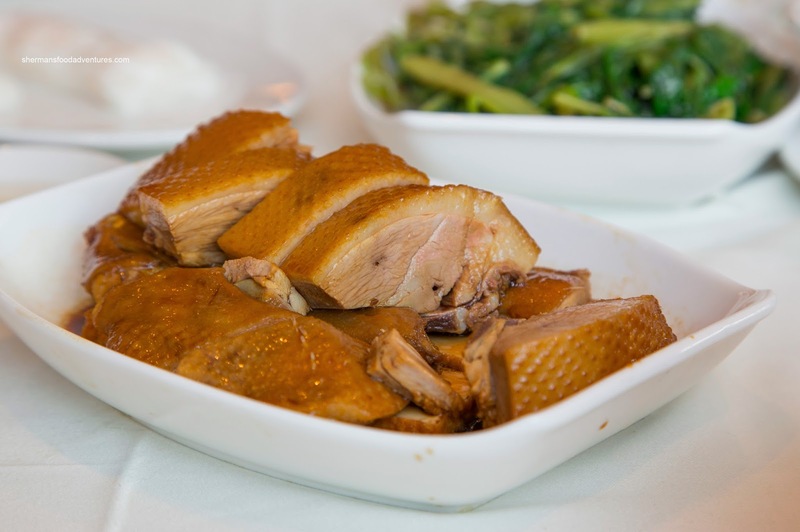 Next up was the Chiu Chow Duck. This was unfortunately hurriedly prepared and it showed. The meat was chewy and lacking in flavour. Furthermore, the skin was equally hard to eat and despite the colour, no flavours actually penetrated it. If it weren't for the garlic vinegar, there would be no taste at all. We ended getting 2 orders of hot pot rice starting with the Pork Spareribs and Phoenix Talons. 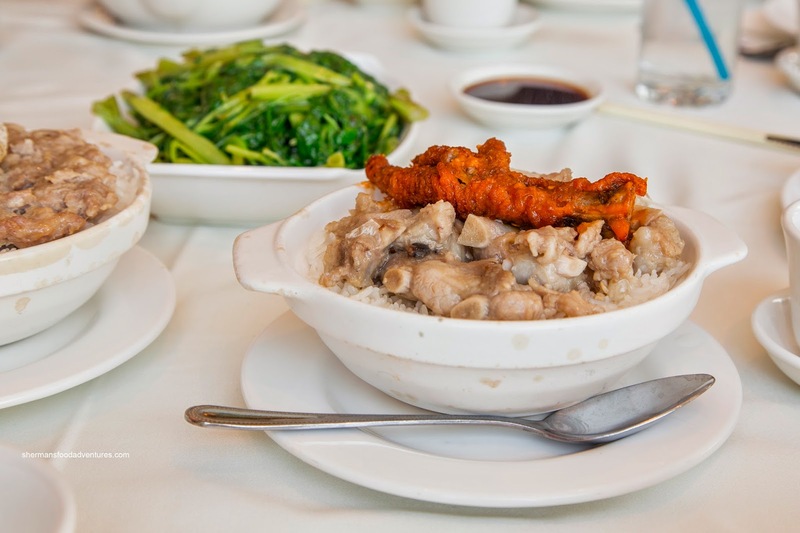 Unlike many other "hot pot" rice dishes, the rice here was actually chewy and dry. That meant there was a degree of nuttiness. However, it did need the sweetened soy as it was too dry to eat on its own. The spareribs had a good rebound texture, yet it did lack seasoning as there was no real distinguishing flavours. The other hot pot was the Ground Pork Patty with Salted Fish. Being a bit fatty, the ground pork was moist and soft. It did retain some meat texture though and it was only mildly seasoned. No real problem as the big piece of salted fish added the necessary punch. Moving on, we had more conventional Cantonese Dim Sum items being the Haw Gow (shrimp dumplings) and Sui Mai (pork & shrimp dumplings). With a slightly thick and wet skin, the Haw Gow was not bad. Inside, it was filled with whole shrimp which were buttery and exhibited a moist snap. It was conservatively seasoned where we could only get sweetness without the usual sesame oil kick. As for the Sui Mai, the dumplings were chewy and meaty (the meat was not fatty). I enjoyed that there was a variety of tastes including sweet pork, woodsy shiitake and the essence of crunchy shrimp. Although it was a minor detail, I liked how they were carefully prepared where each piece was uniform in shape. 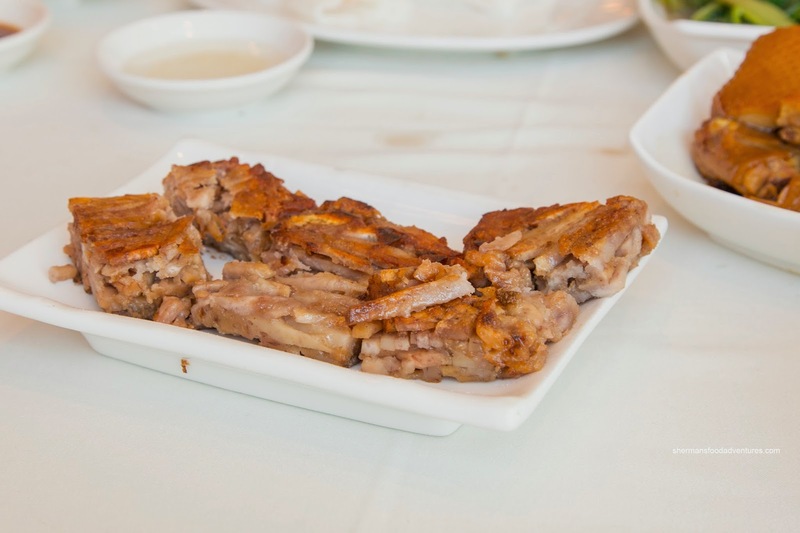 When the Pan-Fried Taro Cake arrived, it certainly looked distinctive with its big pieces of shredded taro. As mentioned, Parklane has Chiu Chow influences and this dish was no exception. With the abundance of taro and very little pudding, the textures were dry albeit crispy on the exterior. We would've liked to see more seasoning as the flavours were flat. 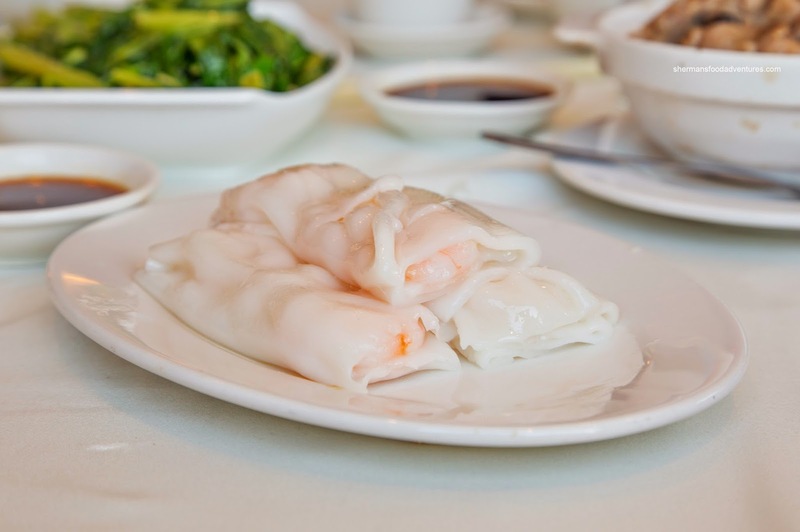 We also got both the Beef and Shrimp Rice Noodle Rolls (only shrimp pictured). The noodle itself was thick and stiff. Inside, the shrimp was overcooked where it was rubbery and chewy. To top it all off, the shrimp was not seasoned very much, hence relying completely on the sweetened soy. The beef was better as it was tender with just the right amount of greens. 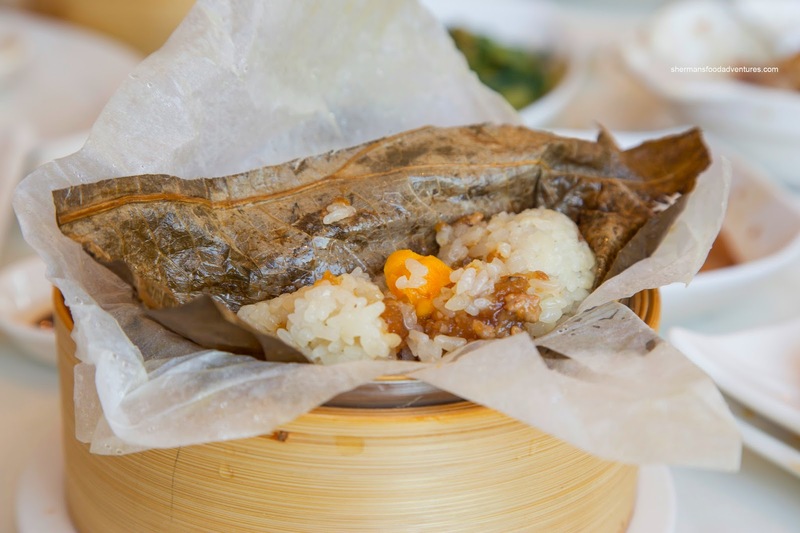 Of course we couldn't forget about the kiddies, so we got the usual Lo Mei Gai (sticky rice in lotus leaves). Steamed not only in lotus leaves, these were also double-wrapped with parchment paper ensuring all the moisture and flavour was locked in (as well as using less lotus leaves in the process). 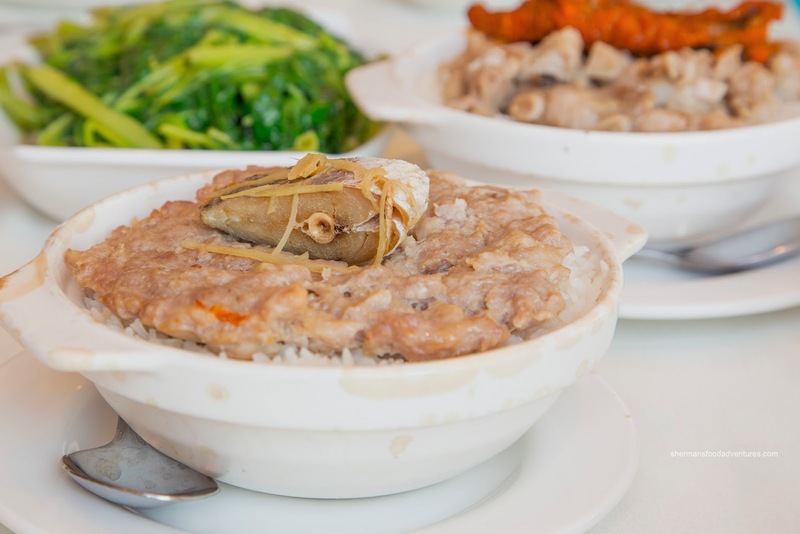 The rice was moist and glutinous while there was an equal amount of ingredients including ground pork (with plenty of starch-thickened sauce) and salted duck egg yolk. Flavours remained mild though. 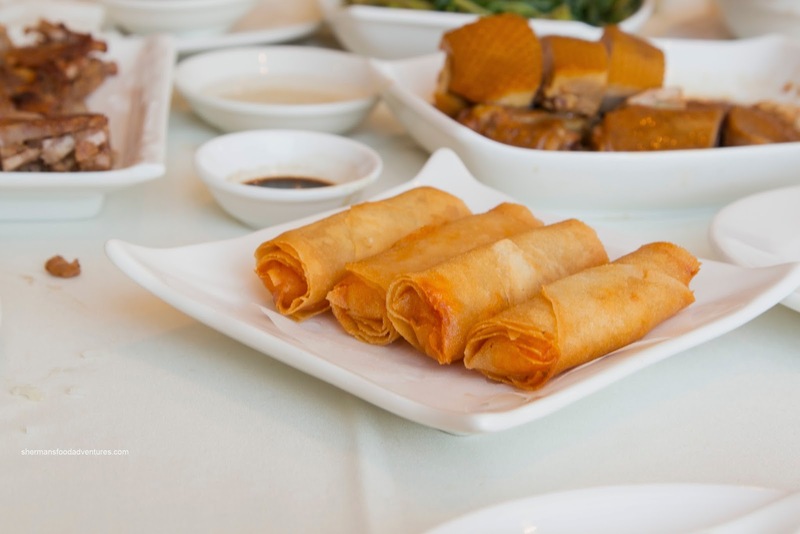 The Shrimp Spring Rolls were also quite good with a crisp, non-greasy shell. Inside, the shrimp had a good snap while being seasoned aggressively with garlic. 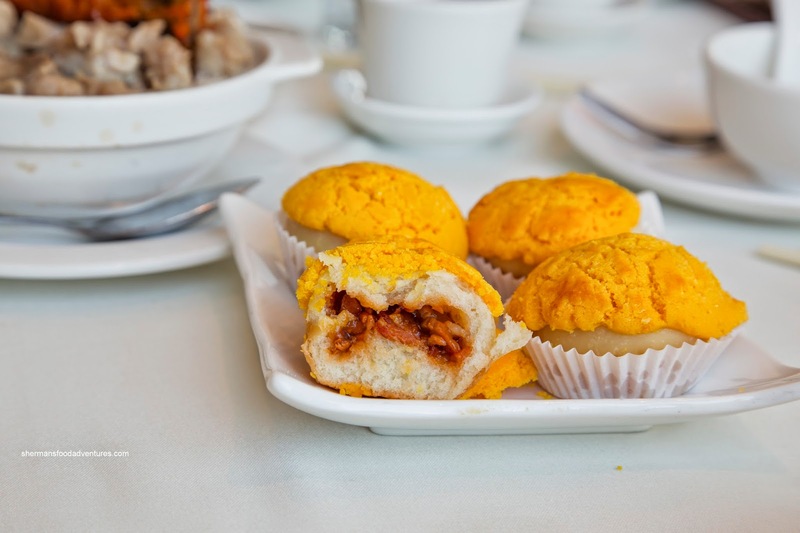 Continuing on with the kiddies, we got the BBQ Pork Pineapple Buns. If you don't already know, no pineapples were harmed in the creation of these buns. The crust just resembles the exterior of a pineapple (whoever thought of that...). These were fluffy and airy with a sweet crust on top. The lean BBQ pork was sufficiently less sweet, so it didn't make this a dessert. 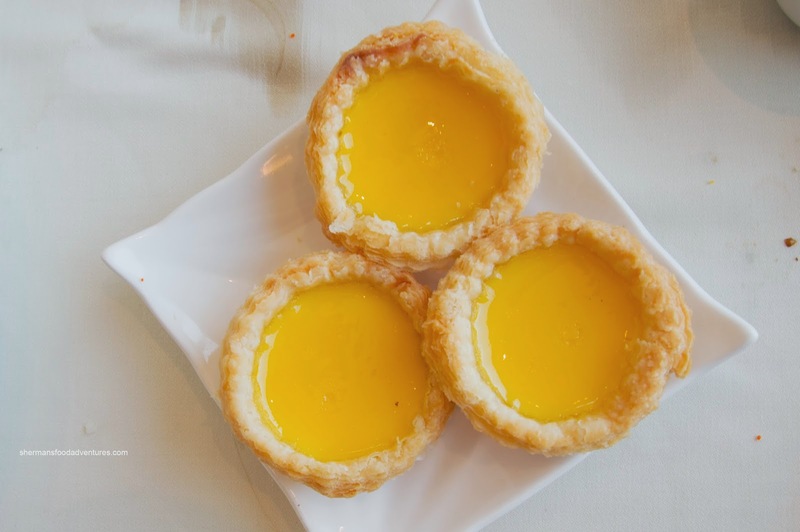 Now for dessert itself, we got the Egg Tarts last. Yay! These were flaky and light with an airy buttery consistency. The custard itself was silky and pretty sweet. 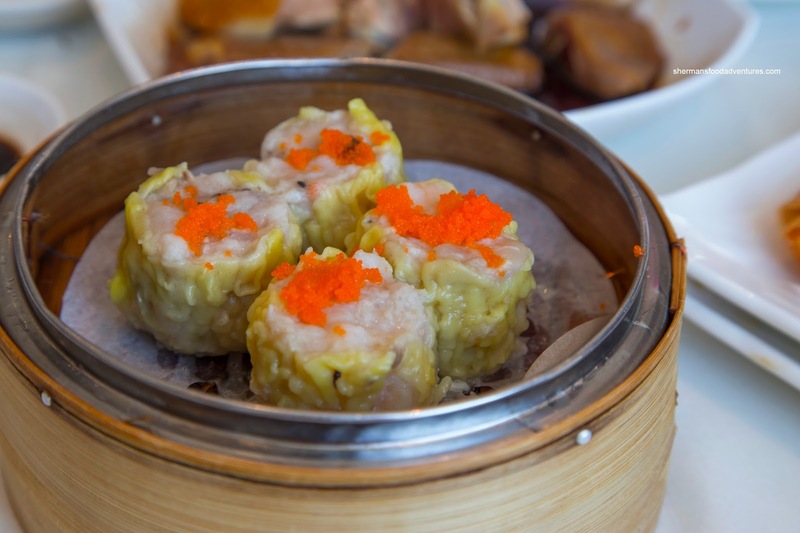 Overall, we thought the Dim Sum service was inconsistent. Some dishes were good while others were not. Considering that they have Chiu Chow specialties on the menu, they weren't very well-executed. This restaurant is located up on the 2nd floor isn't it? I just hope that the 1st photo wasn't taken through your Dash Cam - now that would be real Richmond - style driving LOL! !